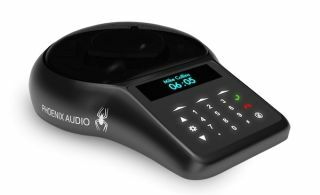 The What: Phoenix Audio Technologies' new IP conference phone, the Spider, will be unveiled during the Enterprise Connect convention, in Orlando on March 17. The Spider is an advanced SIP based IP conference phone, and can communicate through USB interface with any computer under any operating system. This allows it to serve as both an IP conference phone and soft video application speakerphone. The What Else: Small in size (7-inch in diameter), the Spider covers a large conference room with pick-up range exceeding 20 feet. In larger room setups, the Spider supports Phoenix’s proprietary Link-Up/Link-Down Bus, allowing the Spider to incorporate up to 14 slave units in a daisy chain mode, thus providing the ability to cover any size room. The Why: “Two years in the making, the Spider is the most advanced and best performing conference phone,” said Joseph Marash, Phoenix Audio Technologies’ CEO. “Phoenix’s development team utilized their extensive experience and proprietary technologies to produce the best acoustic design, extensive and intuitive user interface, and unparalleled signal processing. The Spider’s superb performance and its unique feature set make it the best audio solution addressing today’s conferencing demands." Clear Audio Performance — the Spider utilizes a powerful DSP and improved proprietary algorithms, including noise suppression, echo canceling, de-reverb, and beam forming with direction finding. Intuitive User Interface — the Spider incorporates an interactive touch button panel and a large OLED display to provide an easy to use intuitive user interface experience. The Spider’s voice tracking technique is enhanced through an under-the-grill set of LEDs that follow a person’s direction of speaking and displays the algorithm in action.